Are you wondering what, exactly, is smashed to pieces in the above photo and how it could have happened? Well, this wreck is courtesy of the Top Gear BBC Television show team. Hosts Jeremy Clarkson, James May and Richard Hammond actually drove a converted Citroen campervan off a cliff for an upcoming episode! 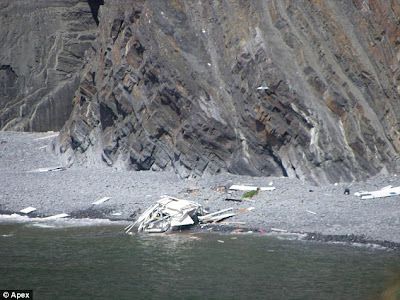 The daring trio were filming in quaint Hartland in North Devon and many locals gathered to watch the culmination of the stunt. The locals are no strangers to taping in the area as movies like Sense and Sensibility were filmed in Hartland, as well as past Top Gear episodes. One such explosive stunt was conducted on the shores of Instow in 2008 when Jeremy Clarkson drove a Ford Fiesta being shot at by Royal Marines. 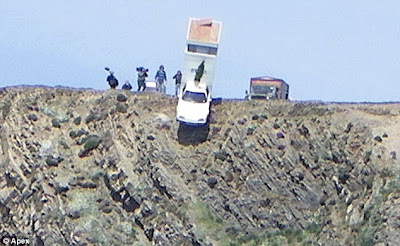 This latest stunt, with the campervan careening off the side of the sheer cliff after the handbrake was left off, is the most dramatic yet. Not that it's the first time the hosts have utilized campervans for their show, as can be seen in the race video below. Looking for a smashing deal on a motorhome rental? Just visit CheapMotorHomes.co.uk. To be on the safe side, though, you might want to stay away from any cliffs or sharp drops--and always remember the handbreak!